All Smiles on January 2nd, 2019…………….. Looking back on the 2018 season I have a lot of great memories. 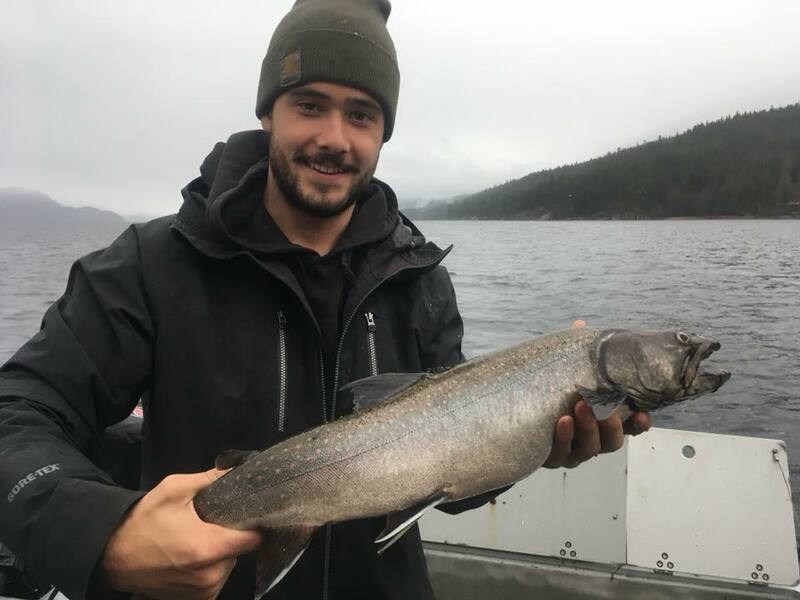 From the fantastic Kokanee fishery in the spring, to the amazing Salmon/halibut fishing in the summer, and the great flyfishing season on the Columbia, and to the great fall/winter fishery we had out on Kootenay Lake, it all combined for another great season. Thank you to all of our new guests and our returning guests for making 2018 a wonderful year. Looking forward to what 2019 has to offer. December was another good month on the lake. It started out with a bang, and slowed down a bit near the end of the month. 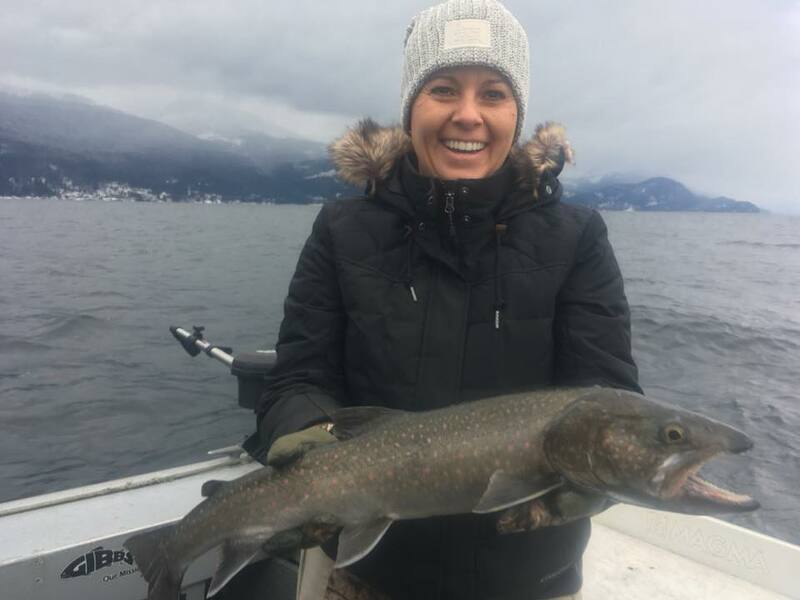 Our early trips saw between 10 -15 fish coming to the boat with the averages sizes being: Rainbows between 2 – 4 Lbs and Bull Trout from 2 – 8 Lbs. One memorable trip was with a boat full of elementary students. The kids were introduced to some great fishing, with each kid hooking into a couple fish each. Some of these fish being either the childs first fish, or their biggest fish. Making it very rewarding for all of us. Its always fun sharing our passion with the new anglers, and hopefully getting them a jumpstart into their own fishing adventures. And as the water cooled down in the last couple weeks, we’re managing to hook into 5 – 10 fish on the good days. December weather made it pretty easy to be out there. 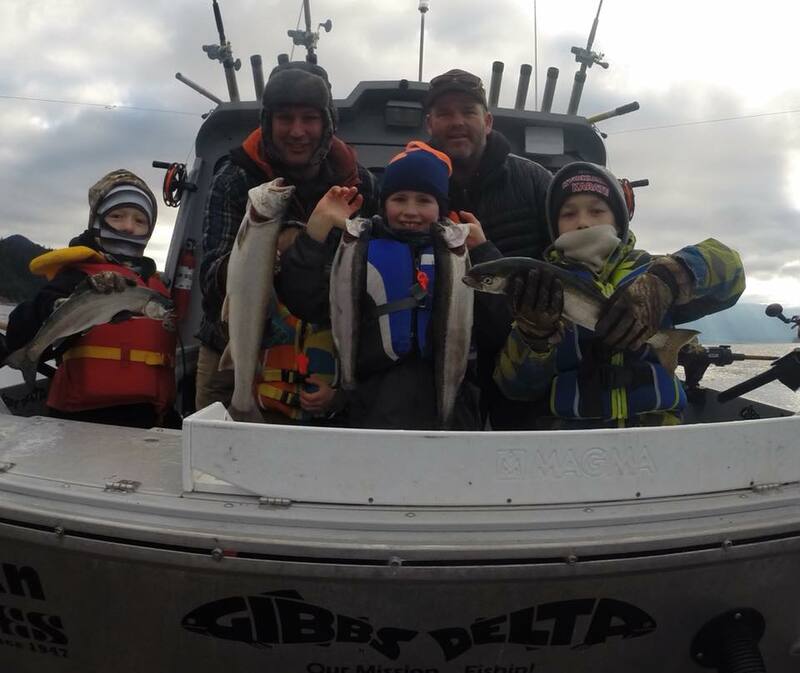 The mild days were very comfortable fishing for our groups, and so far January is continuing with the mild temps, so we look forward to spending a lot of time out there. Some mild days made for some fun fishing on the river as well. We managed to get out a few times from shore and were rewarded each time with some great fish. All Rainbows at this time of year for us, and they ranged from 2 – 4 Lbs. Lots of fun on the spinning rods. January and February usually provide us with some pretty decent fish from the river. Looking forward to more fun times from the shore. Lately, the lake has produced Rainbows on the surface on my favourite buck tail flies and also on some smaller spoons. The usual grey ghost (215) or bleeding gill(210) has been pretty good as of late. And the same old spoons have been producing. My favourite Gibbs/Delta croc spoons have been consistent. The brass/firestripe or the silver/firewing have been the best producers as of late. 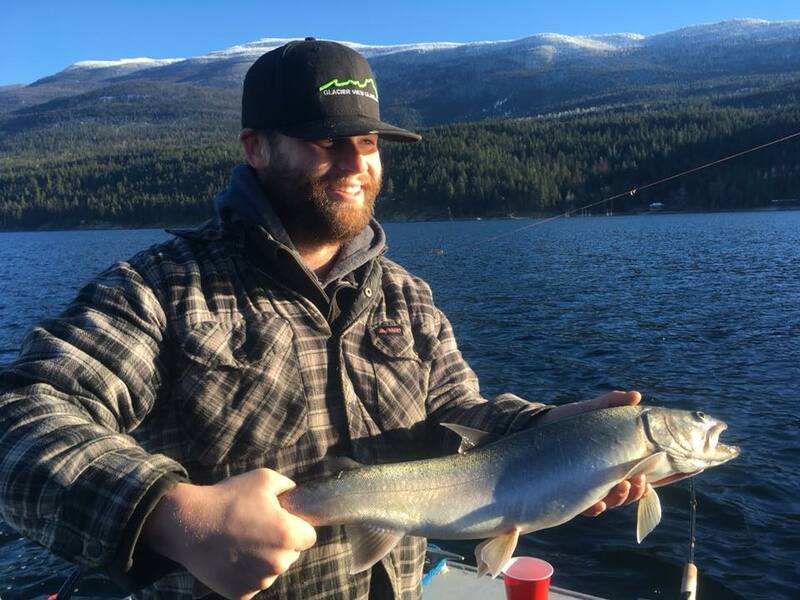 And for the Bull Trout, we’ve been pulling the usual STS flasher or Lemon Lime guide series flasher with either the green spatter back or the the green pistachio hoochie. Or trolling our 4″ Lyman plugs has been catching a few Bulls as well. Favourite depths for the Bulls have been between 80 – 150ft. Another thing to note is the water temperature. The current water temp is around 41 degrees, so that means its time to put on the brakes. Slowing down your trolling speed should help produce more fish. And on the River, its been the usual mix of float fishing with bait, or bottom bouncing with bait which has produced the most fish. The fish are holding in the tailouts or back eddies. So, look for the slower water this time of year.